A root canal, or endodontic therapy is needed to treat the tissue inside the tooth. This tissue is called the pulp, often referred to as the nerve. The pulp can become irreversibly damaged due to infection or trauma. The infection of the pulp typically results from deep decay, which is caused by bacteria. Left untreated the pulp will eventually die. This is called a necrotic pulp. This infection and necrotic tissue can work its way into the jawbone forming an abscess, a serious and sometimes painful infection. filled with an inert material. We do an additional laser procedure know as Photon Induce Photoacoustic Streaming (PIPS). PIPS is a revolutionary new way to more thoroughly clean the complex anatomy found inside of the tooth. This technique is only possible with the Powerlase dental laser. The video to the right is a cool 3D animation of this procedure produced by Lares to show dentists abouth this new technique. I post it here because I think non dentists can learn something from it too. 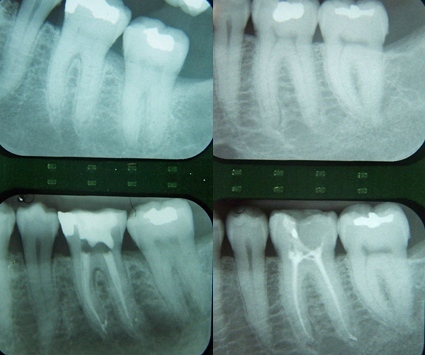 This extra step seems to increase success of root canals and produces a more comfortable post operative course. people will have some mild post procedure discomfort which is usually manageable with over the counter pain medications. Even rarer is the patient who experiences severe pain postoperatively, and in this case we will give a prescription for a stronger pain medicine. 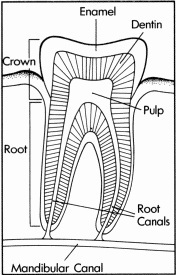 The root canal treats the inside of the tooth. Your tooth still needs to be restored to proper form and function. Sometimes this can be done with just a filling. However, endodontically treated teeth often are already broken down and they become brittle with time after treatment. A crown is usually needed to effectively rebuild these teeth. If the tooth is crowned, a separate procedure called a post and core is often needed to build up the tooth. 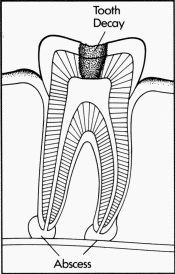 A small post is cemented in the tooth and a core of fillin g material is built up around this post. Root canals are successful about 95 percent of the time. Success is determined on follow-up examinations and x-rays. If the tooth remains pain free without any pathological changes noted in the jawbone around the tooth on x-ray, it is a success. Problems which can develop are the formation of infection, cyst, or scarring at the root tip. Often this can happen with no symptoms so follow up x-rays are important. If one of these rare but unfortunate problems, the tooth can usually be retreated without a problem. Sometimes a minor surgical procedure can be used to treat the tooth as well. Rarely, the tooth will not be salvageable. It is important to remember that with any medical/dental procedure there is always a risk that it may not work. Endodontic treatment has a high rate of success, but you do need to be aware of the risks involved, however unlikely.